Last time I promised you an article on my Compact Macs. Today I'm keeping that promise. First off, the Compact Macs are great machines because 1) they aresmall (that's why they are called Compact Macs), 2) they are relativelypowerful, 3) most of them handle systems up to Mac OS 7.6. Before I talk about my Compacts, I'd just like to mention a coolfeature of a certain family member, the Classic. Not to be confusedwith the newer ClassicII, the Classic was slower and had less possibilities for expansionthan its successor, but it did have one cool feature: It had theability to boot System 6.03 from a built in ROM disk when you hold downCmd-Opt-X-O during startup. I have no idea for what purpose the Cupertino folks built this intothe Classic, but it's still cool. Perhaps it was there for servicepurposes. The Classic II is the successor of the slower Classic. Also known asthe Performa 200, this Compact features a 16 MHz 68030 processor, whichis awesome in comparison to the Classic's 8 MHz 68000 - plus it shippedwith 2 MB of RAM, which was twice as much as the Classic's base of1 MB. It supports System 6.08L,which makes this machine faster than a Pentium 4 with Windows 1.0. (Yes, it's possible! I know, 'cause I've tried it. Feel sorry for me,please.) However, I choose to use System 7.1 as my primary operatingsystem due to compatibility issues with System 6. Versions up to 7.6are supported. My Classic II is maxed out with 10 MB of RAM and a 500 MB harddrive, (God bless eBay! ), which makes it a very fast Mac under 7.1. I always enjoy around of Shufflepuck Café on the Mac, which of course worksflawlessly. These Compacts go quite cheap on eBay or the LEM swap list these days, and they're agreat value. Just don't try Mac OS 7.6; it's like Leopard on a G3 -slow and buggy. For that OS, get a Power Mac! First off, this machine is no longer in my possession, but I doremember it vividly (and fondly!). 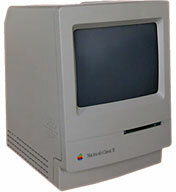 The SE/30 was, simply,the greatest Compact Mac ever built! It supports 128 MB of RAM. It hasa nice screen. It was fast. In conclusion, it was awesome. My SE/30 had 32 MB of RAM and ranSystem 7.5.5. I used an external SCSI CD-ROM drive to install software,and it was great. Let's go back to the memory part. 128 MB. Imagine having that backin 1990! Your friend who was still on a Mac Plus would pass out. So wouldany computer guy. The bad thing is that it only supports systems up to 7.5.5 (althoughI've heard of people using Mac OS 8). Were the SE/30 still mine, I'dtry it. It also has an expansion slot. Mine had a LAN card installed, and itworked fine for surfing the Web. I believe I used iCab for that purpose, although I'm not sure. 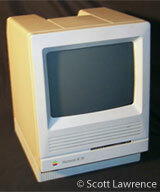 I just read the SE/30 profile here on Low End Mac; it seems it had a100W power supply! Freakin' amazing! My Packard Bell from 1996 (got itlast year for some reason, had it for a month or so) had a 65W powersupply - and it's bigger than the SE/30. It used to crash whenever Isurfed the Web, so I just threw it in a dumpster! If you spot an SE/30 on eBay and don't place a bid, you've made themistake of your life. You are now guaranteed 7 years of misfortune. Seriously, they are great machines and should not be underestimated.In fact, I'm getting a new one shortly. Next time: my desktop Macs.